Spent a good part of last evening perusing my charts box for ideas and finally prepared to start a new project – on linen this time. I am a lazy stitcher and usually prefer simple Aida and quick-to-stitch charts, but every once in a while I go old school and work a linen piece. 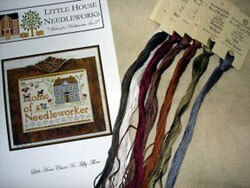 A web grab of the pattern I’ve started is below: Little House Needleworks “Home of a Needleworker Too”. I don’t have the Crescent Colours floss shown, so I color-matched the colors by eye for conversion to my DMC floss collection. I have a stockpile of DMC and usually enough of most types of fabric to do any project if I am willing to substitute here and there. And I usually am!